The work of Justin Wolfers has been a frequent topic in this forum. Stacey offered two posts examining Wolfers study of point shaving in NCAA men’s basketball. And I offered four posts examining the Joe Price–Justin Wolfers study of implicit bias in the NBA. Each of these studies demonstrates an ability to uncover the unseen – and unexpected – in large data sets. Of course playing with data is not the only skill in Wolfers arsenal. He is also a very talented economist (which means he can do more than just play with spreadsheets). Yesterday he demonstrated his ability to use economics to solve problems with a wonderful op-ed in the New York Times. 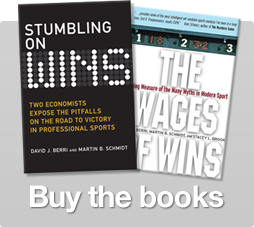 In Blow the Whistle on Betting Scandals, Wolfers offers a unique perspective and solution to the negative impact gambling can have on sports. Basically Wolfers argues we need more gambling – with respect to certain aspects of sports – which will reduce gambling on other aspects of sports and hence reduce the likelihood of scandals. If that last sentence didn’t make sense – and I’m not sure it did– go read the column (or read Henry Abbot’s take on this at True Hoop). And for more from Wolfers (or is it Joe Price? )…three weeks ago I posted on the Western Economic Association meetings, which has become the annual meeting place for sports economists from around the world. The first paper presented in our first session was the aforementioned Price-Wolfers study. My sense is that this paper has typically been presented in forums where the presenter is given more than 30 minutes to discuss their work. At the WEA, though, you only have 15-20 minutes to explain your paper, consequently Joe Price had to leave out some of the material that Wolfers or he would include in a longer discussion. Fortunately, though, I was given a copy of their entire power point presentation, and hence I got to see the whole story that they normally tell. Part of this story is a new look at Win Score. Let me write this out in words. Basically a player’s value is determined by points scored, possessions gained, possessions lost, help on offense, help on defense, and helping of opponents. The Price-Wolfers explanation of Win Score seems a bit more intuitive than what we said in The Wages of Wins. As noted in the book, the Win Score model is designed to be a simple (and accurate) measure of player performance, much like OPS in baseball. The intuition of Price-Wolfers, I think, makes the Win Score model easier to understand. Quoting from the paper… consider a game involving five black starters against four blacks and one white. Thus any team-level differences will be driven by the differential treatment of the fifth player, who is black for the home team, and white for their rival. The coefficients in Table 4 suggest that race-norming the refereeing crew would lead the black player to commit around 0.1 fewer fouls per 48 minutes (relative to the change for the white player). Table 5 suggests that he would also score around 0.2 more points and earn 0.05 extra turnovers. Alternatively, using Berri, Schmidt and Brook’s (2006) “Win Score” metric, the black player’s overall contribution to the team winning margin will rise by about one-quarter of a point under a race-normed refereeing crew (relative to his white rival’s contribution). These individual-level estimates are consistent with the estimates of the “direct” effects measured in Table 6. But recall that Table 6 showed that these “direct” effects on fouls committed and points scored are roughly matched by an equal-sized (and opposite signed) “indirect” effect on fouls awarded, turnovers gained, and points conceded. That is, the away team’s boxscore statistics also change in a way that leads further extends the home team’s winning margin by another quarter point. Much of the discussion of this paper focused solely on the impact on personal fouls. But the finding that players altered other aspects of performance was also quite interesting. When we look at Parker’s Win Score per minute, we see that he was at 0.140 in 2005-06 and at 0.090 in 2006-07. Average for a point guard is 0.128, so Parker went from being above average to below average. In other words, just looking at Win Score gives us the impression that Riley is a bit off in his assessment. I bring up this story to emphasize a point made in The Wages of Wins about Win Score and Wins Produced. Looking at the numbers is not the end of analysis. It’s just the beginning. Coaches have to look into why a player achieved those particular numbers. In the case of Parker, the common problem for guards – turnovers and shooting efficiency – are not the problem. If Riley and his staff can fix the problem areas (rebounds and assists), it looks like this signing could pay off. Of course, if they can’t, then the Heat have simply acquired a below average point guard who is not going to help Alonzo Mourning get back to the NBA Finals. 14 Responses to "More from Justin Wolfers – including an intuitive look at Win Score"
Player A shoots 15 for 30 and gets 30 points. He doesn’t commit a foul, make a turnover, grab a rebound, or make an assist. So his win score is 30 minus 30 equals 0. Player B comes off the bench and grabs a rebound at the end of the game. His win score is 1. Player A is a ZERO on this site even though his shooting percentage is greater than the NBA average AND he did not commit a foul or a turnover. Player B has a higher win score even though he’s the twelth man on the bench and plays 30 seconds. As you can see, the basketball game is stepped on one only foot in that simplistic formula. There’s no counterparting for “points made” at the defensive end (points allowed), the possession is gained just once the ball is rebounded and the defense on the field goal shot is not credited, but this same field goal shot is counted as a whole weighted lost no matter is missed or made (a mayor disorder). Then you adjust for all these defensive stat unavailability, and convert the NBA defense (the most of the time one on one)into a shared defense, but meantime, rebounds still stayed as an isolated defensive action play, what of course it’s not. Also in this logic you can see a possession gained (about 1 point) is allways a succesful end, with succesful continuation when the possession is scored. When the shooter scores, he’s only credited with a piece, because the possession gainer already earned his 1 point. But if the shooter misses the shot, he is twice punished while the possession gainer still keeps his 1 point. Of course in these metrics, possession gainers are not punished every time they fail to gain, or attempt to. You can see possessions are lost only at the offensive end. And also, given that there’s no way to weight or adjust for difficulty of shots and defense faced, nor help efficiency, we must accept that once with the ball in their hands, all players’s scoring metric is determined only whether or not the ball enters the ring (by shooting only), and a 50% (or 33%) “scoring break even” is an absolute metric for all of them, in all situations. The position adjust arranges only per minute stats, but not per attempts (efficiency) actions. defensive ratings of 30 out of 100.
are valued highly by both systems. that Mr. Berri’s system would say the same. say that system has merit. Great comments above Harold and Mr. Parker. I haven’t had the time to re-read Oliver but I think he values Jordan more highly than Berri does. I’m in the midst of buying/selling homes and I wish I could elucidate further. Some notes though… concerning Berri’s approach. WHERE IS THE RISK VS. REWARD VALUATION? Going back to my first comment… Player A takes all the risk in trying to put the round ball in a cylinder. Now let’s add two other players. And let’s simplify all three roles. Player A is the shooter. Player B is the rebounder (power forward). Player C is the distributor (point guard). And let’s hold all their other roles at a constant value. For example, the shooter and the forward could each have two assists and three fouls, etc. etc. For simplicity, let’s hold the other roles at zero. It doesn’t matter if it’s zero or a number as long as non-specialty performance is the same for all of them. Player A goes 30 for 60 and scores 60 points. A great game. Efficient scoring. No turnovers or fouls (but also no rebounds or assists.) He doesn’t need assists because he’s the guy who can actually shoots and his team, knowing he is an efficient shooter, WANTS him to shoot. Player A takes ALL THE RISK in trying to score points because in Berri’s system, he LOSES points when the round ball does not go in the hole. Player B… the rebounder… takes NO risk. He just stands by the hoop and gets the other team’s misses and some of his own team’s misses. He NEVER gets punished for standing around. B gets 15 rebounds but can’t shoot and doesn’t. He takes no risk. No fouls, assists, etc. Player C… the distributor… takes NO risk. He dribbles around and passes the ball. It’s a lot easier to pass the ball to a guy who is BIG, a guy who MOVES to catch the ball with LONG arms. That is so much easier than trying to actually put the round ball in a small hole. Player C TAKES NO RISK. He gets 30 assists because he passes the ball to Player A who takes ALL THE RISK. What are their win scores? Player C is 7.5 win score for merely passing the ball to someone who can do actually do something with it. NO RISK. Player B is 15 win score for merely standing around and grabbing errant shots off the backboard. NO RISK. Player A gets 0 win score for scoring 60 points efficiently and is the only guy who TAKES ALL THE RISK. Gentlemen… none of the PASSING AND ‘GETTING’ means jack unless SOMEONE PUTS THE BALL IN THE ROUND HOLE. If you substitute Dennis Rodman for Player B and the early Jordan for Player A, Berri would prefer Rodman. and UNDERVALUE players who do. When I get time, maybe I’LL write a book. CORRECTION… Player C has a win score of 15 just like Player B. There are SO many things this system doesn’t measure. It measures blocked shots… but most block shots have only 50% chance of taking the possession away. A ‘hurry’ might actually be better as the defensive team has a greater chance at a rebound (defensive rebounds outnumber offensive rebounds). A ‘pick’ is as valuable as an ‘assist’. If we add Player D… the ‘picker’… who frees up Player A (the shooter) and he picks off the defense for 30 baskets scored by Player A… he gets a win score of 0 for ‘throwing the pick’ while Player C gets a win score of 15 for throwing the ball. These statisticians should watch the game a little more and the box scores a little less. I’m not ragging on eggheads, either. I have an MBA with straight A’s in Finance and Statistics. But I’ve played the game. The Dipper would routinely go 25 for 50 and grab 25 rebounds. His win score is 25. His entire value is grabbing the ball. He gets 0 value for score 50 points at a 50% shooting percentage when the average NBA shooting percentage is 40%. EVERY TIME HE SHOT AT A 50% PROBABILITY OF SUCCESS, HE WAS HELPING HIS TEAM. But he gets 0 value for this. But a 25 win score. (For grabbing the ball). NOT LET’S SUBSTITUTE ‘LITTLE MINI-ME WILT’… a 5’8” guy who doesn’t get any rebounds. Goes 25 for 50. Get’s 0 win score. EVEN THOUGH EVERY TIME HE SHOT AT A 50% PROBABILITY OF SUCCESS, HE WAS HELPING HIS TEAM. Mr. Berri… you should spend less time posting new articles on your flawed system and more time learning from us masters. I meant… “NOW let’s substitue Mini-Me Wilt”… not ‘NOT’. Complete players with very few shortcommings at both ends will be at the top no matter which metric is used (a not adjusted linear metric can explain about a 70% of reality, ball-on-hands reality). The problem comes with unidimensional players. Metrics will overrate or underrate these players acording to its bias, and that’s produced by using totally different and divorced methods to measure defense and offense, or not using a good solution (or anyone at all) to do counterpartings that boxscore can’t do (points). WP is a metric that measures and weight “win games” actions, not just individual skills unfolding (that can stay short when you correlate to wins). It’s designed so, and that is the confussion when you try to compare this metric against another. The problem comes when putting worth and price to those skills and players wich possess them, based on the result only, obviating the difficulty of the process. It may be “relatively” easy to gain a possession (even with an inbound pass you get one, and you gain a lot of possessions that you did neither defend nor steal at all), the problem is to convert it in a score, and shooting% might not be the last word here. Shooting defense attempts are not treated like its counterpart at the offensive end in any metric, and all is left to be decided in the battle of rebounds. Here Player C is the most productive player, and Player D is the least productive, with C’s extra rebounds being responsible for getting his team over the line. Sorry if this line of argument has been brought up before. I don’t know how Win Score could (or should) be adjusted to reflect this, but basically I think something needs to be done to put scorers and rebounders back on an even playing field. Position-Adjusted Win Score could go some way to addressing this, although I don’t think it adjusts for the fact that the role of a player at a particular position may vary from team to team. Sorry, a friend has pointed out that in my examples rebounds don’t equal missed field goals, but I think you can fix the examples so that my general points hold true. Hi Troy no worries we all make mistakes. This is a great article i thorougly enjoyed reading it on this cold winters night in the UK!